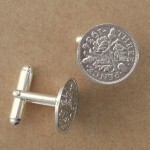 The cuff-links are all made with solid sterling silver fittings. 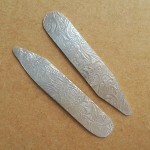 Collar points/collar stiffeners are also made from sterling silver. At present the silver threepenny cuff-links and embossed collar points are in stock but other styles can be made to order. Please email or telephone to discuss your requirements.